On Monday, January 21, Martin Luther King, Jr. Day, Tarrant Churches Together sponsored a Day of Service to 47 different locations. St. Stephen’s Day School Supply Room (formerly the Adult Choir Loft) was on that list. Luckily, our church elder Ann Mills works at Tarrant Churches Together and she got our name on the list. Fortunately, three lovely ladies from Nu Birth Missionary Baptist Church signed up to come organize our disheveled Day School supplies that morning, just after the Youth Overnight Lock Out. 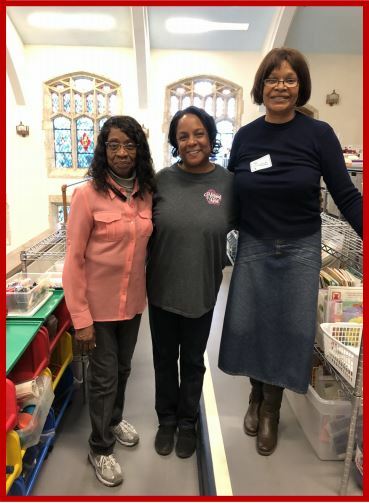 The ladies: Dr. Bev Thornton, Barbara Grimes and Patricia Banks and our sleepy youth leader Beth Fultz organized most of the supplies in the loft. They took care to make sure that the view from the Parish Hall up to the loft was pleasing. The Day School was blown away by their efforts. These ladies are also planning to host the youth on a Sunday evening and share their church culture with us! Many, many thanks to the angels from Nu Birth.